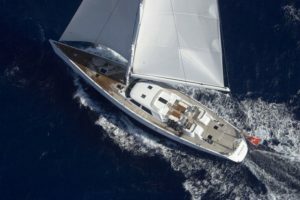 The 34.15-metre sailing yacht Nephele by Y.CO has recently been sold after being on the market for only three months, with Ben Barlett from Y.CO representing the seller. Once called Ipanema, the aluminium sailing yacht was built in New Zealand by McMullen & Wing in 2003 and has since been meticulously maintained and is in excellent condition. She features naval architecture and exterior design by world-renowned German Frers, while her interior design and styling were carried out by Auckland Maritime Interiors in collaboration with McMullen & Wing. Stylish and comfortable accommodation onboard Nephele is provided for up to seven guests, split across three staterooms, including the owner’s stateroom, a double stateroom and a twin cabin. Five crew staff are also accommodated onboard. Thanks to her 425 HP Lugger Diesel engine, Nephele can reach a maximum speed of 12.5 knots and a cruising speed of 10 knots. Nephele boasts exceptional sailing performance and easy handling.